Psalm 37:4 says "Delight yourself in the Lord; and He will give you the desires of your heart." In the original Hebrew, the word "delight" is 'anag', meaning 'to be pliable'. To be pliable means to be soft, as if to be molded into something. For something to be molded into something else it has to yield to the will of the creator...like clay in the hand of a sculptor or potter - the clay readily yields itself to be molded and shaped into whatever the sculptor desires. 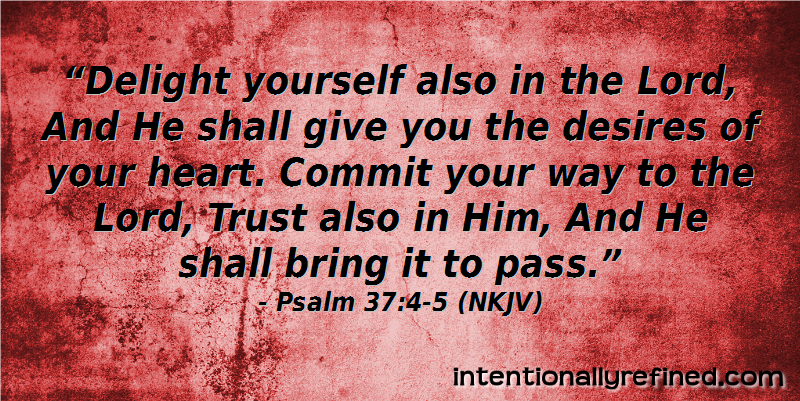 Now, if you re-read this passage this way it makes more sense as to the original intent of the scripture: "Yield (be pliable) yourself to the Lord and He will give you the desires of your heart"
The scripture goes on to say in verse 5, "Commit your way to the Lord, trust also in Him, and He will do it!" Which is taking the sentiment in verse 4 another step. Using the analogy of clay and sculptor again, after yielding to the sculptor's hands, the clay must 'trust' the sculptor to create something beautiful out of a lump of clay. Likewise, when we yield to God, we must trust in Him to create something beautiful from our lives, knowing that He knows what is best for us. 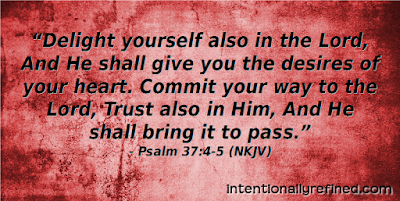 It is only when we totally yield and commit ourselves to God that we will begin to see the rewards that God has for us. For in yielding to Him and doing His will, we become what He wants for us...to be more like Him. Eventually making His desires, our desires.